I have been watching “Mad Men” on Netflix. The rampant sexism and racism in that drama set in the 1960s shocks me every time. I don’t know why it surprises me. My grandmother has told me stories of how hard it was being a woman in the military during the 40s-50s and a working woman during the 60s-70s. She also faced some harsh discrimination for marrying outside of her race and for being twice divorced. When I see these attitudes on “Mad Men” or hear stories of how things used to be, I am disgusted. I am also oddly relieved and filled with hope. Things are still not equal, but they have gotten exponentially better. All we have to do is look around our class and see how many women are studying art. The women artists we study in survey courses were so extraordinary prejudicial boundaries were unable to contain their talent. First off I feel Mary Cassatt was one of the best impressionism painters that their was. I also see that e have major issues with time of womens rights in the “working” world. She did engage of paintings of the private lives of women if we see many of her works. They see very much of non-strugle and of proper manners and how life just was, but not a disgrace. I also feel that all artist that paint subject matter close to their race, gender or culture will feel a wrath from the outside since this puts up walls not breaks them down. The art world has pretty much always been dominated by white males. This really means nothing, it means that this is who has been the majority doing such works. Also as I see her works I do not see a fight for equal rights in her work. I see amazing works that read as what they are nothing more. In life all walls seem to fall, but in our modern day with acceptance of cultures and ideas I think we are letting people put walls back up and its not leaving room from growth only stunt their of. It seems like a form of suffragism. Women weren’t just fighting for the right to vote, but it seems for the right to express themselves in a world and field that was dominated by men. In the Baroque period, we have a few female artists who made a name for themselves, but they were quickly forgotten. It seems strange, to me, that a woman can do pretty much anything she sets her mind too, just like a man, but that people (both men and women) make them fight harder to be recognized. Especially when that thing is outside the current society’s norms for that gender. I think Mary Cassatt had a great talent and she, and others, had every right to fight to be recognized for the talent that they had. I know that in many countries around the world, women are still fighting this same fight, even today. Men were afraid of being challenged by what was seen as an “inferior” person. The art world was known for its predominantly male masterpieces and feared not only competition but the views of a woman. I think that during this period along with most periods, society didn’t believe that women understood their environment and that they should therefore have no interpretation or opinion about it. Either that or they didn’t want to see works from a woman’s perspective because it bore no weight on their lives. Obviously, being that I’m a female artist in modern day, it is difficult for me to imagine a time when women were so undervalued and unappreciated. And as far as the quote above…I think that Degas was well aware of her talent but still chose to disregard and dismiss it as talent. This just goes to show the ignorance of the times. I think that with the rise of women’s right, the right to vote in the 19th century, and pushing the rights for equality, the art world was also a major part of that movement. 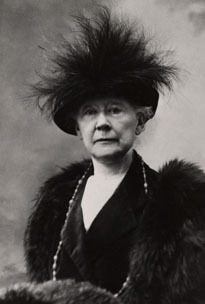 Artists like Mary Cassatt were big contributors to that fight. It was important to show that gender did not determine if a painting is a masterpiece. Even though Mary Cassatt struggled to get the same recognition as male artists, she was still an amazing painter and her work spoke for her talent. ”I will not admit that a woman can draw so well.” This statement clearly shows the rigid ideals and discrimination women face in the art world. A movie on Netflix called ‘Who Does She Think She Is?’ is an eye opening documentary about female artists that strive to be more than what society keeps them from being. Like Mary Cassatt, the women in the documentary had a strong passion for art but also worked with sustaining and keeping their families, working for a living, all the while fulfilling their true calling in life which is art. Mary Cassatt has an amazing impressionistic and sketchy style as do the women in the film have their own styles. Unfortunately, the art world is still mainly dominated by men. During the nineteenth century, women did not have as equal of opportunities as men did. Yes, there were more job opportunities in the factories and they could now get an education along with men, but there was still an inequality. Women were looked down upon and seen as incapable of doing anything men could do. Male artists already had a tough time with criticism of their art, and being a woman artist in this period of time was highly difficult. I admire Mary Cassatt, as she became a notable impressionist in spite of the discrimination towards women in the arts. Edgar Degas said, “I will not admit that a woman can draw so well.” This is very dense statement. Even though male artists could see the talent, they were just too arrogant and egotistic to admit women could be great artists also. The fight that women had to put up in order become artists is what I think made their paintings especially beautiful. And I don’t just mean aesthetically…Yes, women had to work harder, they had to fight for their place, but without that fight, the importance and meaning of the paintings are not as great as that of a man’s today. While technicality, content and emotion in a painting are important, the story and the journey of both the artist and painting should also be taken into consideration. This isn’t to demean Cassatt’s talent however, but to reinforce the fact that not only was she so talented that she managed to succeed in a man’s world and become recognized but also that her paintings have a unique aesthetic and emotional journey that would not have been present in men’s paintings at that time. Left out Degas…. that unique aesthetic and the successful struggle must have intimidated male artists, causing Degas to make a comment such as that. I think it shows how strong women can be. This entry actually makes me think of Ghandi’s quote from class today, ” First they ignore you, then they laugh at you, then they fight you, then you win.” Even though people denied to give credit to women that had amazing talent like cassatt, she does win because she never gave up. She worked hard and knew that people knew she was talented but too afraid to admit it. I think as long as you know what you have to offer the world, it shouldnt matter what anyone else thinks. She knew she was talented and peoples negativity didnt stop her from doing what she loved. The remark that Degas made reveals the obstacles facing a woman artist in the latter half of the nineteenth century. It is proof of Cassatt’s determination and talent that she was accepted during her lifetime as one of the premier artists of those days. 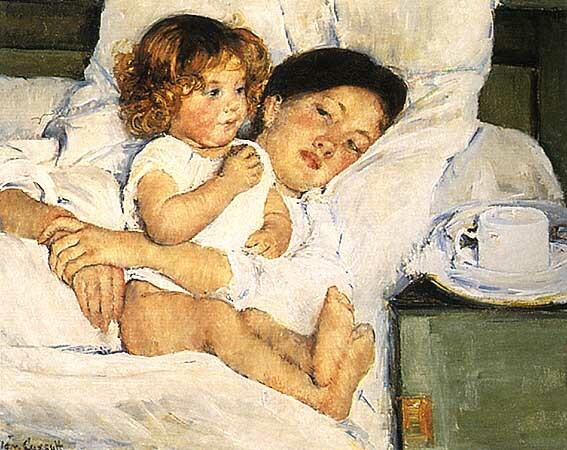 After learning of Mary Cassatt, she has inspired and motivated me greatly because I myself is an impressionist. It shows in Cassatt’s work that she firmly believed that the only way of learning to paint was to see, and copy great paintings. I think that the statement ”I will not admit that a woman can draw so well” by Degas toward Mary Cassatt, is a very powerful statement. It almost contradicts itself, at first it sounds like an insult to woman artists, but then towards the end of the statement he compliments Cassatt on how well she draws just by using the word “so”. I think that she is an amazing painter and should be acknowledged just as much as the male painters of that time. There were many female artists before Cassatt that fueled the way for her to be able to be accepted. Mary Cassatt is an example of a woman who did what she wanted despite scrutiny and this continued to pave the way for woman artists to come. Men of that time were intimidated by intellectual women that stood up for themselves as individuals and who provoked thought. Mary Cassatt was one of these people. Degas’ statement makes me know that she was not completely accepted. Although he may have acknowledge her talent, he couldn’t get over his pride to come out and say it in an attempt to support her. Women like Mary Cassatt paved the way for women artists today. At this time it was definitely a white man’s world. Women who wanted to succeed in a felid other than a school teacher or a nurse had to go out of their way to do so. I can’t imagine what a person like Mary Cassatt went through in order to become successful. I am sure there were plenty of times were she felt like it was going to be impossible with the way she was looked down upon and how men did not give her the time or day with her talents, but she was strong and because of her success she opened many doors for other women. Her works were done absolutely beautifully and I feel like Mary Cassatt was one of the most successful artists of her time and I’m sure became a threat to many male artists. I believe Mary Cassatt to be one of the most admired painters in the history of painting. She set the stage for women artists by not giving up on her talent at a time when the odds were against her in an all male art world. Cassatt painted in a style of her own not looking to be like anyone else. With works that were strong and noticeable in their own right. She was determined to be seen and heard in her paintings despite what anyone say.And by doing so allowed other female artists do continue their skill as painters as to one day be on the same level as male artists, which Cassatt helped to push even further by not giving up on her desire to paint. The fight that woman had to put up with was termendous, expecially before the 19th centry. As a woman artist I am glad that I now have the right to share my talent and have it be known, because Marry never gave up gives every woman artist more hope. She was obviously tallented and people did notice. Mary Cassatt is one of the lesser known impressionists, but none the less a very skilled artist. I think its great that she was able to be recognized and exhibit with French imressioniosits of the time. Clearly, Degas saw her talent and though his sexist remark is an indicator of the inequality of the time period, he supported her craft. “The Child’s Bath” is probably the most recognizable of her works, and also my favorite. I like her art because it depicts the intamacy between two family members– usually mother and child– whereas most impressionist work focuses on landscape than genre scene. Cassat is one of the women who pave the way for later female artists to express their creative voice. I think that it is awesome that she not only was able to prove herself and become successful but that a male artist such at Edgar Degas recognized how talented she was. It is much easier today to compete as a woman, I believe, but I feel like we still have a few obstacles every now and then. And women like Cassatt show us that it is possible to fight for privileges and succeed. It is not surprising to see women treated as Mary Cassatt was treated with her artwork. My thoughts on it are the same as all other acts in society in which women are suppressed. One should not be criticized for anything due to their gender. Gender does not even effect her talents as an artist and it is a shame that living in a patriarchal society that women had to fight to be recognized and respected in society. I think that it is a very good thing thing that women are finally getting the respect that they deserve. It is pioneers like Mary Cassatt and Rosa Parks who helped break the barriers against gender discrimination. It must have been a very difficult time for Mary to have loved to do something and be very well at it, but yet not able to receive the proper recognition for her excellence. By looking at the way she drew it is apparent that she was among the very best of her time. Mary Cassatt earning the respect of a famed impressionist such as Edgar Degas was not only important in recognizing womens’ contributions to the art world, it was also a building block and motivational factor in increasing the right’s for women in other areas. The prejudice and idea that women could not do things as well as men was simply wrong and Mary Cassatt proving that she could have just as much skill and determination was crucial into proving that.